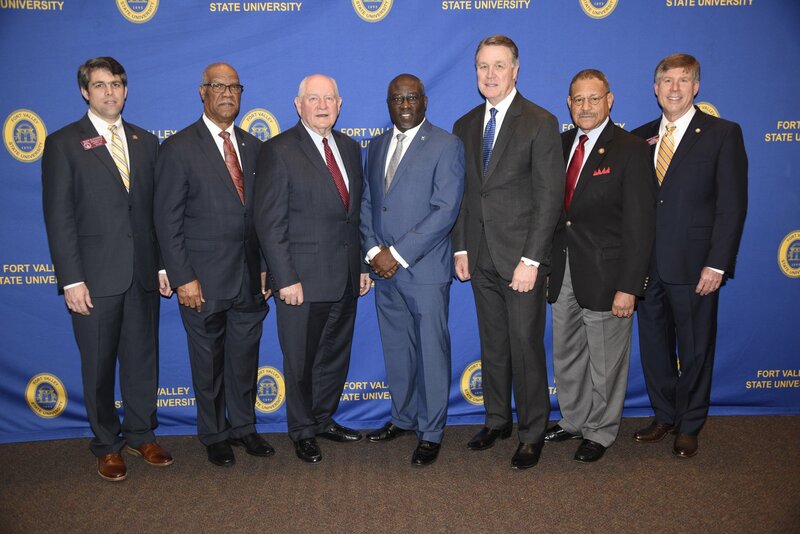 Main image caption (left to right): GA State Representative Shaw Blackmon, GA State Representative and FVSU Foundation Board Chair Calvin Smyre, United States Secretary of Agriculture Sonny Perdue, FVSU President Paul Jones, United States Senator David Perdue, United States Congressman Sanford Bishop, and GA State Representative Robert Dickey. U.S. Secretary of Agriculture Sonny Perdue headlined the 37th Annual “Ham and Egg” Legislative Breakfast as the keynote speaker for the April 5, 2019 event. The event took place from at the C.W. Pettigrew Farm and Community Life Center on FVSU’s campus. The former Georgia governor joined U.S. Senator David Perdue, U.S. Representative Sanford Bishop, Georgia State Senator John Kennedy, Georgia State Representatives Patty J. Bentley, Shaw Blackmon, and Robert Dickey, and and other state and local leaders to discuss 2019 legislative priorities affecting the state’s agriculture industry and higher education, including the implementation of the 2018 Farm Bill and the recovery from Hurricane Michael. Among other notable policy developments, the 2018 Farm Bill added scholarship funding to traditional U.S. Department of Agriculture support for research, education, and extension programming at 1890 land-grant institutions, which are colleges designated by Congress to disseminate knowledge in the areas most critical to American competitiveness, including agriculture. FVSU is Georgia’s only 1890 land-grant institution. FVSU’s “Ham and Egg” Breakfast is an annual event sponsored by Fort Valley State University’s Cooperative Extension Program. It serves as a forum for Georgia residents and elected officials to discuss issues related to agriculture. The name pays tribute to the historic “Ham and Egg Show” created in 1916 by Houston County Extension agent and FVSU alumnus Otis O’Neal. Featured in Life magazine, the show drew thousands as it allowed African-American farmers for the first time to showcase their agricultural products. Located on FVSU’s campus, it became so popular that it spawned a Folk Life Festival, believed by the Library of Congress to possibly be the first African-American folk festival in the country.